The earth archetype may have a darkish complexion, strong thighs, and wide jaws. Of all the aspects of their bodies, earth types should have strong muscles. The earth person has to watch out for gaining weight, because a large belly and somewhat fat body are attributes of the earth type. They may not be very ambitious, yet they are calm, generous, and normally centered. Earth represents stability, and harmonizes between all other elements. Being fair is a predominant quality of an earth type; they also can be trusted with starting a plan. When in balance they are very centered, when out of balance they tend to worry constantly, and may be prone to digestive disorders. They may be susceptible to arthritis if their muscles are not strong. They make great managers and organizers, though their focus can be weak, making handling multiple tasks very difficult. They respond to change well as long as it is gradual. The earth element relates to the spleen and stomach, the tissue it controls is the muscle. The orifice that it opens up into is the mouth. Sweet and fatty type foods comfort the spleen, and it controls the sense of touch. The negative emotion of the spleen is pensiveness, worry, and anxiety. The positive virtue is serenity and centeredness. The colors yellow and orange, and earth tones support the earth element. To benefit this element hang pictures of flat lands or plains. The earth element is represented by architecture that is both flat and square. Having your surroundings made of “earth,” which include brick, or even concrete, is positive for supporting earth. Avoid foods that have excessive amounts of sugar. Foods that may help uplift fatigue due to weakness are yams, corn, and certain rice. 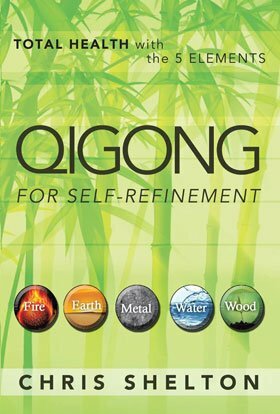 People that need to balance out their earth element will greatly benefit from Qigong practices that help root the Qi, and practices that help harmonize the stomach and spleen.